The best way to learn qigong is to ask "the what, why, and how" of your practice. 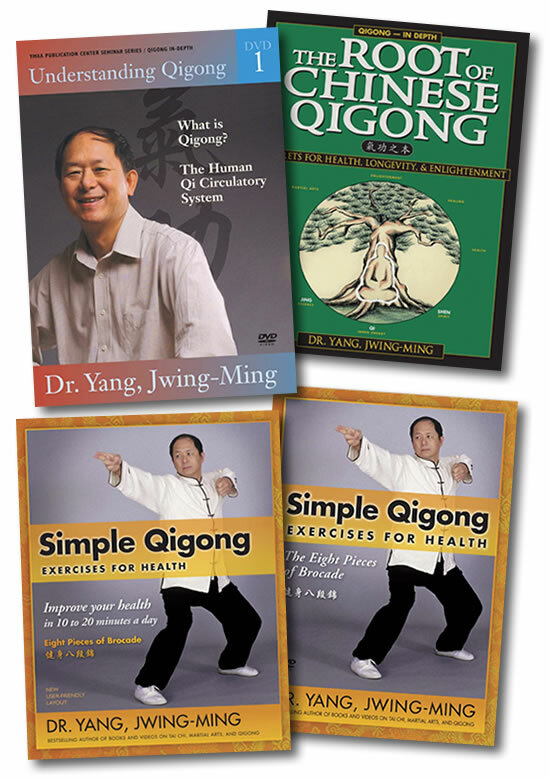 This collection addresses these important questions and offers a simple and powerful beginner friendly qigong health program. You will practice a standing set, or a sitting set. You will examine the theory, and principles of qigong in a beginner friendly way with the guidance of Dr. Yang, Jwing-Ming. One of America's most sought after instructors of qigong. The perfect starter set for the inquisitive qigong beginner. Bundle contains 2 books and 2 DVDs. These gentle stretches and breathing exercises stimulate your immune system, strengthen your internal organs, and give you abundant energy. This book offers beginners a smart way to learn qigong (chi kung), the ancient Chinese system of gentle breathing, stretching, and strengthening movements. Choose the sitting set, the standing set, or both. Learn how to activate the qi energy and blood circulation in your body, helping to stimulate your immune system, strengthen your internal organs, and give you abundant energy. Qigong training can improve your health, cure illness, and help you overcome the stress of daily living. Qigong is the study of Qi, or vital energy, that circulates in the human body, and it has been practiced by the Chinese for thousands of years. Qigong is a unique and comprehensive approach to health and longevity, and can be trained by anyone. Get the most from your practice by understanding the principles and foundation of this ancient science. Dr. Yang teaches sitting and standing meditation, demonstrates massage techniques, and explores the Qi pathways in your body. He explains correct breathing methods, shares secrets for quieting the mind, and discusses how to increase your body's Qi supply. In addition, he also explains important concepts such as the Three Treasures and regulating the body, breath, and mind. Whatever style you practice, you'll find the keys to successful training in the Root of Chinese Qigong. Drawing on his 35 years of training in Qigong and his Western scientific background in Physics and Mechanical Engineering, Dr. Yang presents a clear and fascinating explanation of his Qigong theory, and offers a simple Qigong exercise for students to begin experiencing their Qi. This program is a must for Qigong practitioners, acupuncturists, energy healers, and anyone interested in understanding exactly how and why Qigong works.